“The very best outsourced presentation we have ever had; innovative, funny and intelligent. You fulfilled the brief and more, strengthening our client relationships, and drawing awareness to product. Performed around the world, Theatresports® is a series of comedy scenes and creative challenges based on audience suggestions. Performers create instant comedy scenarios and characters with no preparation. It’s the basis for such television shows as Whose Line is it Anyway? and Thank God You’re Here and it is hilarious to watch in action. Impro Australia’s high-energy interactive stage shows are ideal entertainment for almost any function where laughter and interaction is appropriate. Our corporate team have perfomed at board meetings, weddings, 50th birthdays, retirement send-offs, 21st birthdays, conference openings, product launches and one wake. IA performers can utilise members of your audience by makinmg them the stars of the sketches that we perform on stage. Impro Australia has performed Theatresports® in Sydney since 1885 and ensures that participants in its shows and workshops come away feeling empowered and very much entertained by the experience. Working to a brief, IA will customise our format and delivery to meet the aims and objectives of your event. • Promotions and product launches. Theatresports itself will always be Impro Australia’s most popular show. It’s inclusive, easy to stage and gets the audience laughing, interacting and participating with the performers on stage. High energy games and challenges similar to the TV show ‘Whose Line Is It Anyway?’ and any of our Theatresports stage shows people may have seen. The show is very flexible and can be tailored to highlight a specific conference message, objective or theme. This show brings audience members up onto the stage and they become the stars of our comedy sketches. The success of Channel 10’s “Thank God You’re Here” has focused attention on the wonderful skills and comedic possibilities of theatrical improvisation. Impro Australia (IA) is the organisation behind Theatresports®. 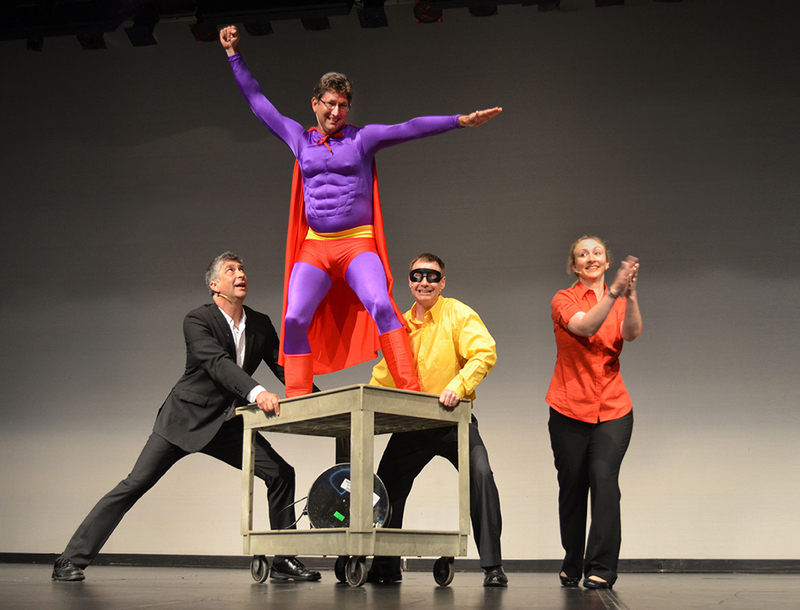 Performed around the world, Theatresports® is recognized as the original and most popular form of improvised comedy. Our team contains performers from the original TV cast of “Thank God You’re Here”. Impro Australia has created a unique corporate show that gives the client a very similar experience to “Thank God You’re Here”. The main difference is that the special guests who walk into the surprise scenario are people chosen from the event’s audience. Whisked out of the room to be dressed in full costume, these participants become the stars of the “Thank God Here’s Theatresports” scenes. IA can also tailor a package to suit most events and locations and our shows have minimal technical requirements.